Between Action Comics, Superman, American Alien, Lois and Clark, and Neal Adam’s new Coming of the Supermen series, the variety of takes on Clark Kent in DC’s current slate is something to be admired. They all offer some pretty great insights into the Man of Steel as a character.... but some of these insights are less absurd than others. Very minor spoilers ahead for Superman #50, by Gene Luen Yang, Howard Porter, Ardian Syaf, Patrick Zircher, Jon Bogdanove, Hi-Fi, and Rob Leigh, and Coming of the Supermen #2, by Neal Adams, Alex Sinclair, and Erika Schultz. This is about one “high score” reference away from being every conversation about video games in modern media. Everyone’s hair in this book is a spectacular mess. It’s so good. Yes. It’s that sort of comic, a throwback to the preposterously fun sort of dialogue in the ‘70s era that Adams ruled over at DC. It would be easy to lambast all this silliness as DC not taking the character seriously enough, but honestly? I love it. 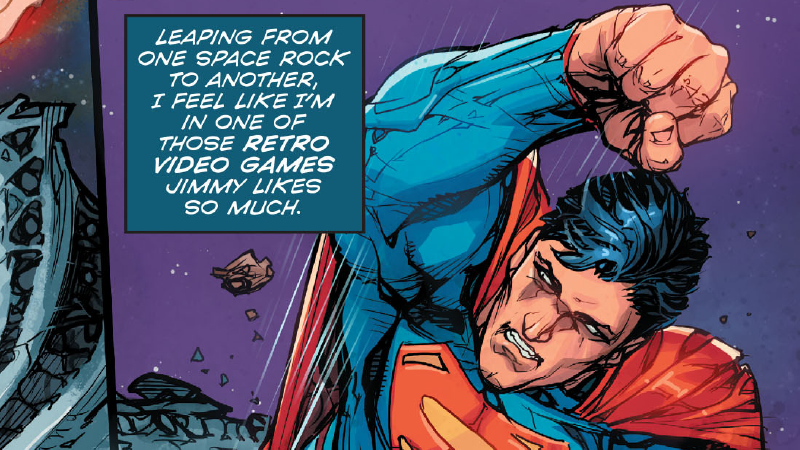 There’s a goofiness and lightheartedness to the swathe of Superman books in DC’s roster at the moment—a counter to the self-serious beating the character has taken over the past year—that is completely refreshing. Whether it’s Clark Kent being a big ol’ dork in Superman, or the madcap throwback vibes of Coming of the Supermen, it’s great to see the Superman books pick up with actually interesting and fun storytelling... something DC haven’t really been nailing with the character lately. I’ll take a little cheese over villain-of-the-month boredom any day of the week.